Cumulation of poor soil removal will cause hazing of the laundry. The Industrial Cleaning Monitor is used for measuring the primary washing performance (soil- and stain removal) of industrial laundry processes. Using the monitor is very easy. The set is washed once with the washing process to be tested. After drying the results can be measured. The results will be compared with the reference values or the (pre)determined quality objectives of the (end)customer. With intermittent use (eg monthly) the results can demonstrate, by means of a trend analysis reports, that the washing process in the field of soil and stain removal shows continuity, and thus corresponds to the pre-determined (quality) objectives. With this an assessment of current versus new washing processes can be displayed. For this purpose, the results obtained are compared with reference values. These values are based on an independent reference standard washing process (with oxygen bleach) which is highly controlled. The resulting values of this process are called: reference values. With these values it is possible to compare the results of the tested process with the standard process, giving an indication of the quality of the tested process. Another useful application is to improve the washing process. 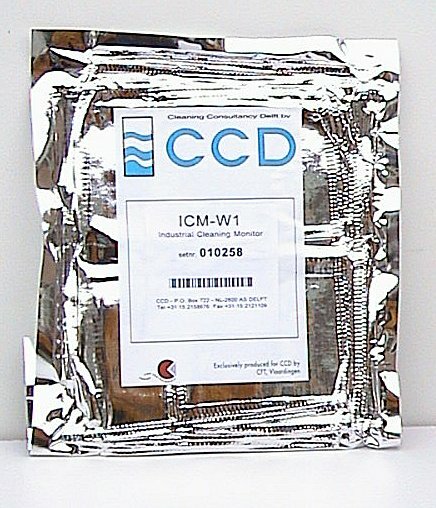 ICM monitor results demonstrate any shortcomings of the current washing process after which a targeted improvement action can be taken. It is also possible to use the monitors without these values for comparison of washing processes, washing machines or chemicals. 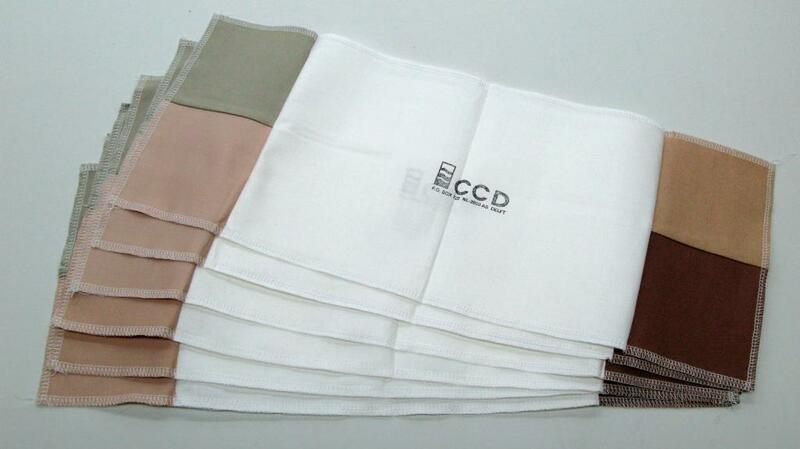 One set consists of three carrier cloths made out of standard cotton to which four soil / stain types are sewn. Oily soils occur in all kinds of laundry, even in hospital laundry. For example: ointments, paraffin, human grease, entrapped dust etc. Model for food stains. A food stain is a complex kind of soil. It contains fat, protein, carbohydrates and pigments. In this case wine. The removal of this kind of stain gives also a good impression of the removal of fruit juices and tea. To check the protein/blood removal of the process. Even if there is no blood present in the laundry other soil types containing protein can be present like food stains. The tristimulus blue remission of the washed monitors is measured with a tristimulus type colorimeter. If you do not have such an analyser available, we can measure the results for you. * Targets are declared by the customer who has washed the ICM (quality objectives in consultation with the (end) customer) or else the standard reference values.